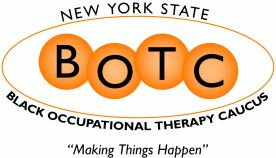 The New York State Black Occupational Therapy Caucus (NYSBOTC) is a not-for-profit organization comprised of Black Occupational Therapist, Occupational Therapy Assistants and students who live/work or attend an accredited Occupational Therapy Educational program in New York State. The New York State Black Occupational Therapy Caucus was established in 1975. It is a local chapter of the National Black Occupational Therapy Caucus established in 1974. In an effort to support Black clinicians and students, our commitment to financial, educational and professional development efforts will be maintained via Scholarship Awards and Mentorship. The purpose of the NYSBOTC is to serve as a vehicle that brings together Black OT’s COTA’s and students to identify, share and attempt to resolve issues germane to Black OT personnel. The NYSBOTC corporation is organized exclusively for charitable and educational purposes, including, for such purposes, the making of distributions to organizations that qualify as exempt organizations under section 501(c)(3) of the Internal Revenue Code, or the corresponding section of any future federal tax code. Membership is only $40 for Practitioners and FREE for Students. NYSOTA advocates tirelessly for all practitioners throughout New York State. Your support provides representation, education, information and advocacy.